It’s no secret that I love Smuggler’s Notch because it offers not only great skiing but lots of fun activities for families. 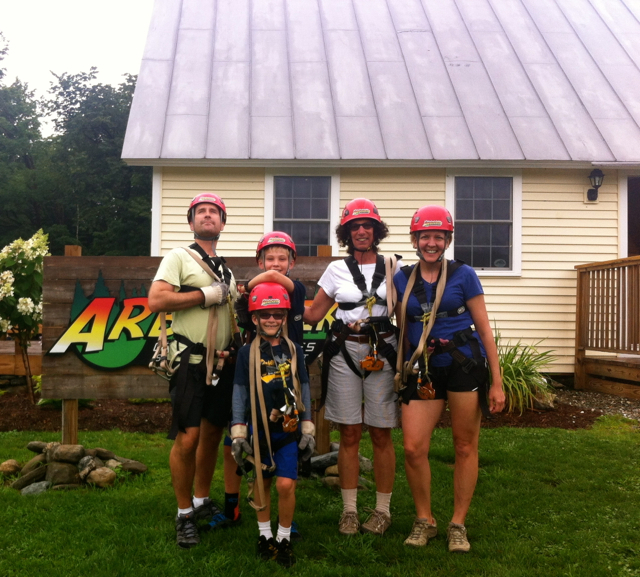 So when I was invited to take a complimentary ArborTrek Canopy Adventures zipline tour there at the end of my summer vacation – and to bring my entire family including both my sons and my stepmother Joan – I jumped at the chance to head over for a half day of fun. The ArborTrek Welcome Center is located just north of the Smuggler’s Notch Resort Village, about a five-minute drive on Route 108. We started our tour by suiting up with harnesses, helmets, and gloves and practicing on a short line. Everyone quickly learned how to brake using our hand on the line (this is surprisingly easy to do). Every tour has two guides, one to go first and the other last. To make sure no one comes in too fast, the first guide stands on the far platform and signals when to start braking. For kids in particular, a concern is that their lighter weight will cause them to get stuck in the middle of the line and then have to pull themselves hand over hand to the end, so they have to learn to watch the guide and brake only when told. After a few practice runs and tests of our “brakes” we were all ready to head for the course, which is about a ten-minute drive from the base area. 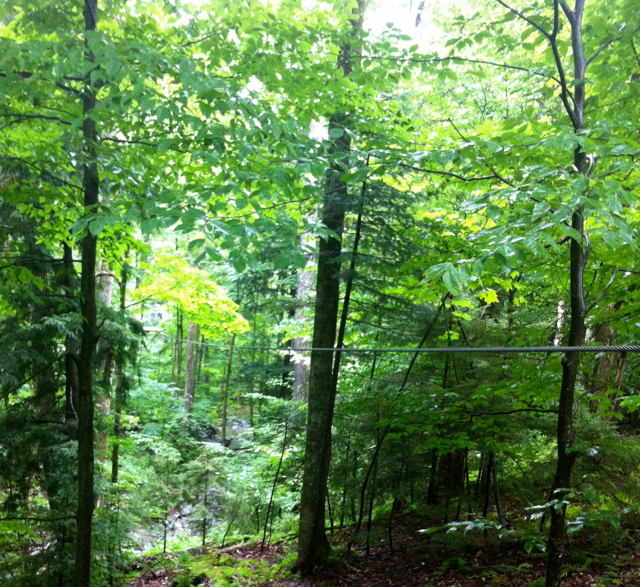 The tour actually consists of eight different ziplines, which disappear into the trees ahead, beckoning adventure. 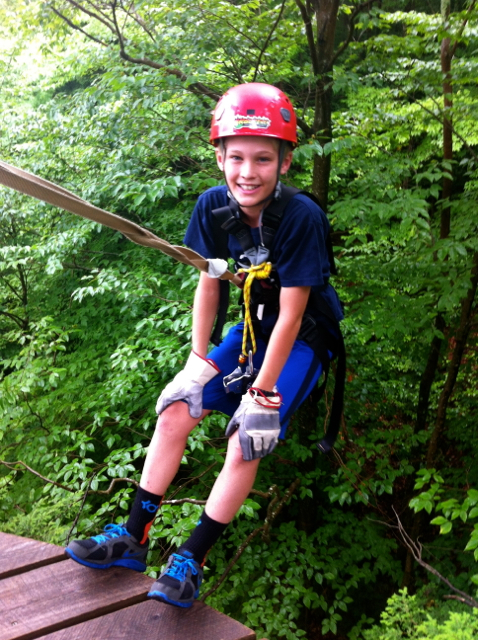 Eleven-year-old Tommy could hardly wait to start and took off without hesitation. Tommy was eager to get going. In between rides you hang out on platforms, some a hundred feet in the air, with lots of opportunity to get a bird’s-eye view of the forest. Tommy, Joan and I enjoyed hanging over the edge of the platform. (Tommy and I both fell off, but were immediately caught by the ropes.) This activity is perfect for a kid Tommy’s age. It’s completely safe but made him feel like a superhero. Tommy loved the feeling of hanging off the ropes. The longest line on the tour is an impressive 1000 feet. Zipping through the forest with the wind in your ears, a stream burbling beneath your feet and the trees all around you is very likely the closest thing to flying that you’ll ever experience. It can be a little intimidating to step off the platforms and go (although I felt no fear at all once I’d done it once). Eight-year-old Teddy, who was riding tandem with the guides, started the tour reluctantly, but by the end was yee-hawing like a cowboy at the end of each run. Teddy rode tandem with one of the guides. 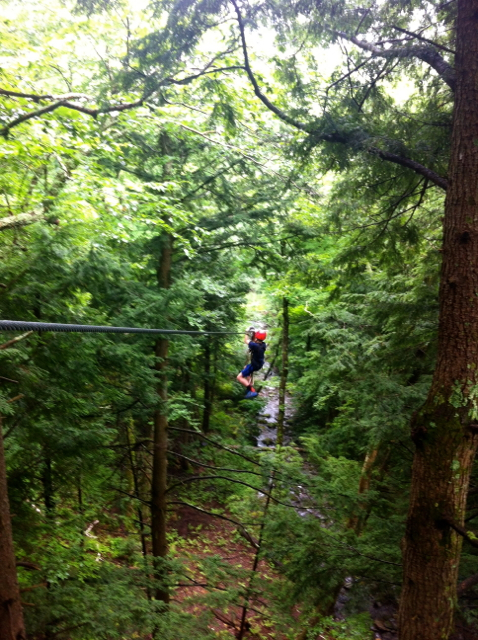 In addition to the fun of racing along the lines, the tour includes other adventures like walking on a suspension bridge and also twice rappelling from the platform to the ground. I was shocked when at the first rappel Teddy volunteered to go first and fearlessly swung himself off the platform to position his body against the side of the tree. Teddy leading the way on the suspension bridge. Safety is at an absolute premium on these tours. 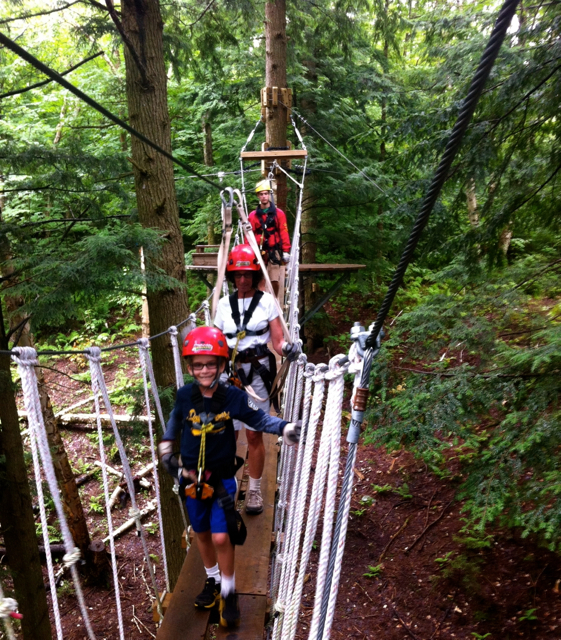 Everyone is attached to the lines by two sets of ropes – that way you are always connected, even when you are transferring from line to treetop to line again. I felt completely safe in the hands of our experienced guides and had no concerns about trusting Teddy with them. We were securely attached at all times. I loved seeing the smile on Teddy’s face when we were finished. Not only did he enjoy himself, he definitely gained some physical confidence. Teddy ended up having a lot of fun. I know that it may be a little bit jarring (or for some of you, wistful) to see all the green in these photos, but there’s a reason I’m sharing this post now. 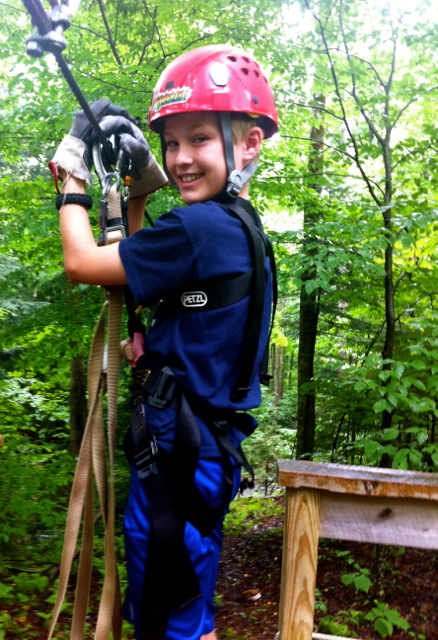 ArborTrek Canopy Adventures is open year round. So if you are planning a ski trip to Smuggs (and you’ll find links at the end of this post that tell you just why I recommend doing so) you can add this to your list of fun winter activities. I actually think that the tour would be even more beautiful in the winter, with better views. Here’s some photographic evidence to that effect. 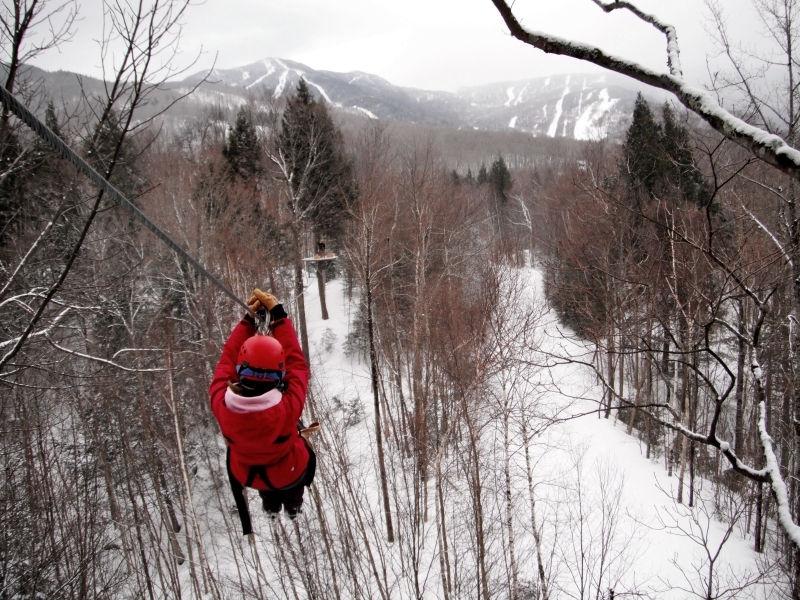 Riding the zipline in winter looks totally beautiful. And if you’re still not convinced this is fun, maybe this video will persuade you. 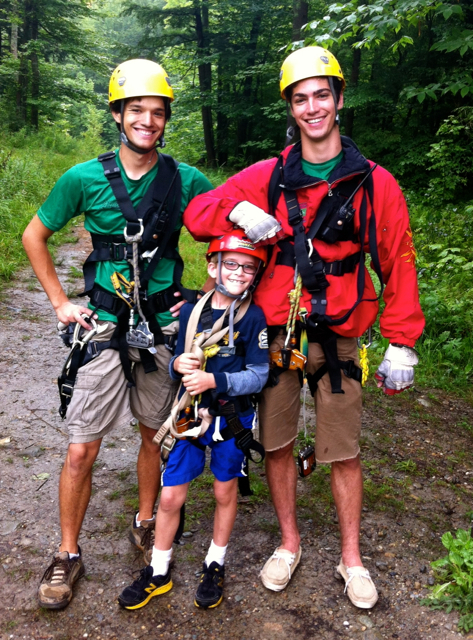 Although the ArborTrek website says that zipline tour participants must weight between 70 and 250 pounds, they were able to accommodate Teddy (who weighs about 60 pounds) by having him ride tandem with one of the guides. If you’ve got a smaller or younger kid, call to ask about how he or she might be included. There are several different tour options. We went on the Wild Ride, which included the full course and took just over three hours. 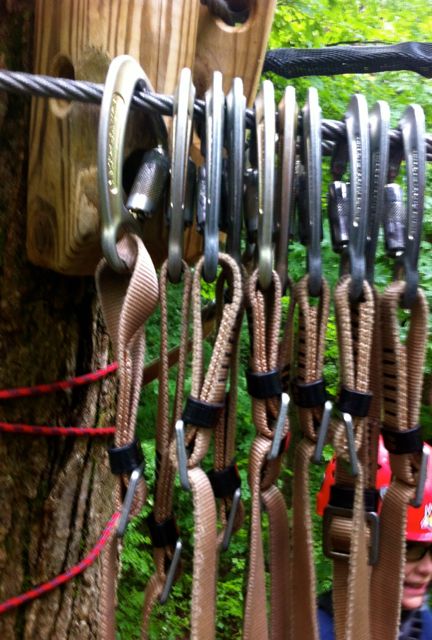 There’s also a shorter version of the tour that includes only three ziplines. In the summer they also offer a treetop obstacle course. Call to see what is available on the day you want to visit. It goes without saying that you’ll want to dress warmly for this activity in the winter. You should also wear clothing that is water-resistant and that you don’t mind getting dirty. And don’t assume your tour will be canceled because of the weather. It was rainy on the day we went; we all just got a little wet. 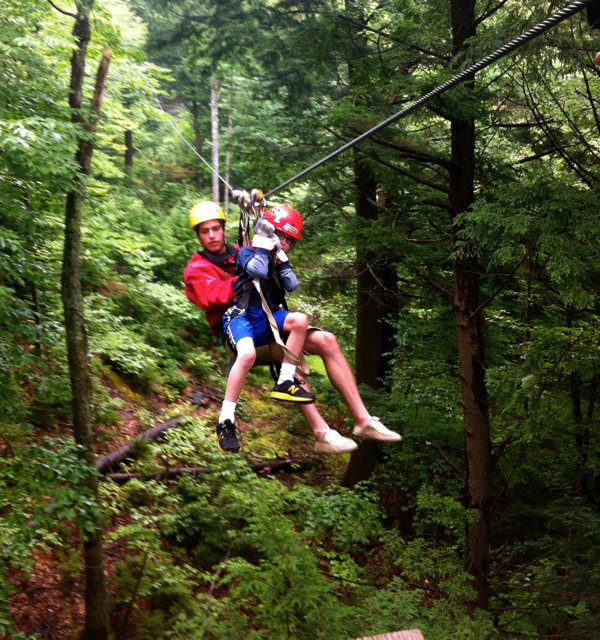 Ziplining isn’t the cheapest thing you’ll ever do; it costs between $65 and $99 a person. If you are staying at Smuggler’s Notch or have a pass there you may be able to get a discount, so be sure to ask when you book; you should also check the discounts page for special deals. In my view it’s worth the cost and although our tour was hosted I would definitely pay to do this again, maybe at a different time of year. Want something to eat when you’re finished with your tour? In winter I recommend heading down Route 108 to The Mix Café in Jeffersonville. When the road over the notch is open in the summer it’s a quick drive to Stowe where Crop makes a great stop for a family lunch or dinner. 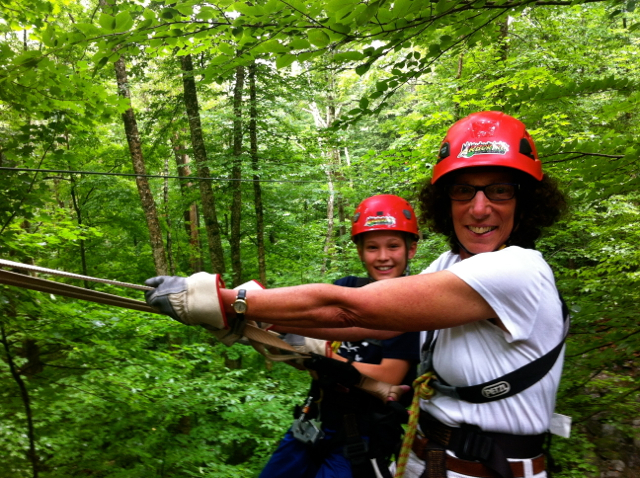 Many thanks to Smuggler’s Notch and ArborTrek Canopy Adventures for hosting our zipline fun. You can always count on me to share when I’ve received something for free and to share my honest opinions.